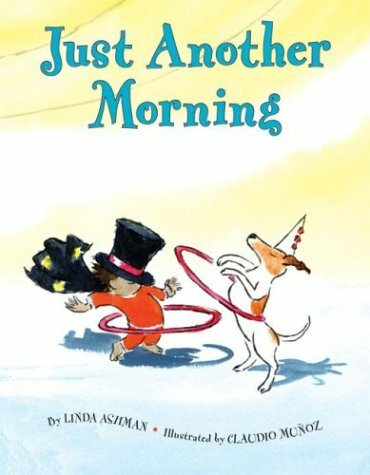 There’s really two stories in “Just Another Morning,” but they’re both a lot of fun. A little boy wakes up in his bed – surrounded by his favorite stuffed animals – but he imagines that he’s waking up inside a zoo. And then he has to tiptoe past the sleeping giants (his parents), down “a mountain long and steep” (his staircase). His imaginary story is very exciting, filled with lots of dangerous adventures, but the illustrations make sure that everything stays cute. Illustrator Claudio Muñoz uses soft colors and big, round shapes, so the imaginary story looks more like a cartoon drawn with a crayon! The “beast” is the family dog, and the feast comes from the tasty snacks in the refrigerator. There’s a green monster in the closet – the family vacuum cleaner – and then the boy builds a castle out of chairs. Unfortunately, soon the “giants” are awake, appearing angry as they burst through the door into the kitchen. The boy rushes into the garden, where he plays with “a spitting snake”: the garden hose. It’s fun to imagine how this book got written. Linda Ashman composed the poem, but presumably she also knew what the illustrator would be drawing. This might be a good book for younger readers, because the pictures and the illustrations always have a real connection. Of course, it might confuse the youngest readers, if they take the text too literally! This is one of the trickiest drawings in the book because now the little boy is lost in his imagination. But the monkey looks like the stuffed monkey he’d imagined at the zoo, and the “clown” is just the family dog again, wearing a party hat. There appears to be a real cat in the drawing, but it’s just staring dubiously at a dangling hoop. And then suddenly the “giant” reappears and scoops up the boy. “I can’t break free,” he says; though, in the illustration, it’s the boy’s father who’s smiling gently. The boy ends up taking a nap in his room, and in a funny twist, the book ends exactly where it begins.